Many hotels claim to be at the centre of a city, but in the case of The Fullerton Hotel Singapore, a newly installed brass plaque at the Hotel’s South Plaza marks the original position of Mile Zero, adopted circa 1909 as the origin of all road distances on the island. The hotel is sited in the Fullerton Building, which is Singapore’s official epicentre from which all of Singapore was mapped and measured back before postcodes were implemented. The landmark Fullerton Building has been gazetted as Singapore’s 71st National Monument, and once housed the city’s General Post Office, Chamber of Commerce, Marine Department and other government offices. For nearly a century, the building has played a pivotal role in Singapore’s history. While the Hotel now bestows all the modern amenities you would expect from a five-star hotel, it has maintained the original coffered ceilings, cornices and restored Italian marble floors from its rich history. 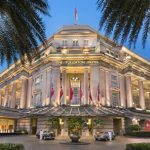 As custodians of Singapore’s heritage, The Fullerton Hotel Singapore is committed to the preservation of Singapore’s history and the conservation of its heritage buildings. Hotel guests can learn more about the history of the Fullerton Building and the significance of Mile Zero, by joining the complimentary Fullerton Heritage Tours: The Fullerton Monument Tour and The Fullerton Maritime Journey Tour. The Fullerton Monument Tour departs from The Fullerton Hotel Singapore three times a week from the concierge desk on Mondays and Thursdays at 10.00 am and 11.15am, and on Saturdays at 3.45pm and 5.00pm. Tours are led by a resident guide and include behind-the-scenes access to preserved areas within the Hotel. The Fullerton Maritime Journey Tour sets out from The Fullerton Bay Hotel Singapore’s concierge desk, this time on Fridays at 3.45pm and 5.00pm, and Sundays at 10.00am and 11.15am. From its early days as a trading post in 1819, to its current status as a bustling cosmopolitan city today, guests on the tour will be captivated by stories of the city’s historic waterfront. Both tours last approximately an hour and can be booked in advance. Tour reservations can be made here. 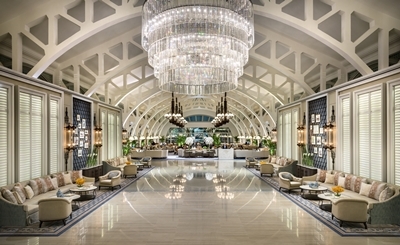 The Fullerton Hotel also accommodates a heritage gallery, where guests and the public can immerse themselves in a comprehensive museum experience, featuring rare postal archival materials dating back to the 60s, and videos of pioneer personalities who have lived, worked and played in the historic precinct. To mark the 90th anniversary of the Fullerton Building and Mile Zero status this year, The Fullerton Hotel Singapore has created a special Mile Zero cocktail, crafted with vodka, Irish cream liqueur and Milo. There’s even a version for the kids – the Mile Zero mocktail, a Dinosaur-esque drink featuring fresh milk, plenty of Milo and crunchy cereal. For the ultimate celebration, try the irresistible Mile Zero cake, meticulously made from layers of rich chocolate mousse balanced with tart rosella cremeux. 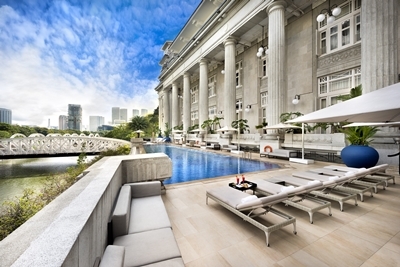 Whether you choose Singapore as a stopover city or a destination in its own right, the charming grandeur of The Fullerton Hotel Singapore will give you a slice of the country’s history, all while living in the present. The most pressing challenge will be squeezing it all in – from museum visits, to divine dining experiences, to a burgeoning bar scene, and slick shopping – a sojourn in Singapore has it all.